FISHING REPORTS ARE VITAL IN THE PLANNING OF A FISHING TRIP! What have the bass been biting? What lures have been working? Where have the bass been located in the lake or river where you plan to fish? These are questions that reports can answer when an angler plans a trip to do some big bass fishing. Effects of high water levels or passing cold fronts can ruin an extended fishing trip or any fishing tournaments. It is always best to check on these things before getting too deep into the planning process. Reading reports before actually planning the trip is the best way to NOT get disappointed. Reports need to be up to date, not six months behind, not even a month behind. I have tried to supply reports that are current so that anglers know what is going on when they go bass fishing. I will have reports here for every state in the U.S.A., eventually. If your state is not listed here, it will be soon. I am working on it. I intend to supply reports on bass fishing for every state that has bass. Most of the reports will include bass and anything else that swims within that states borders or along its shoreline if it has a shoreline. Some states do not have bass but they have other fish to catch. Some states do not have good reports but I posted the best ones I could find! For those unfortunate states that do not have bass, such as Alaska, reports will be supplied for the fish that do inhabit its lakes, rivers and bays. And if you have seen any mermaids in your area....send pictures! Now scroll down and find the state you are looking for. But first, if you have a largemouth bass you want to show off, then send a picture using the form below. Mississippi has the biggest bass in America! If you can prove me wrong then send a picture and prove it! Have a great time fishing and always be safe. A Largemouth Bass Bigger Than Mine? Fishing reports usually include pictures of bass. Mississippi has the biggest bass in America! Send me a picture of a bass from your state or country and tell me about where and how you caught it. 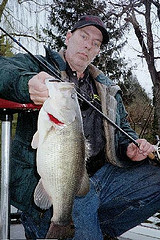 Go to my MS Bass Fishing page and look at those big sows there. There ain't none bigger than that. Prove me wrong! Then click on the link if you want to upload up to 3 more images. If you submit more than 1 image, each image will appear as a thumbnail image. Each image is clickable to make it appear larger.